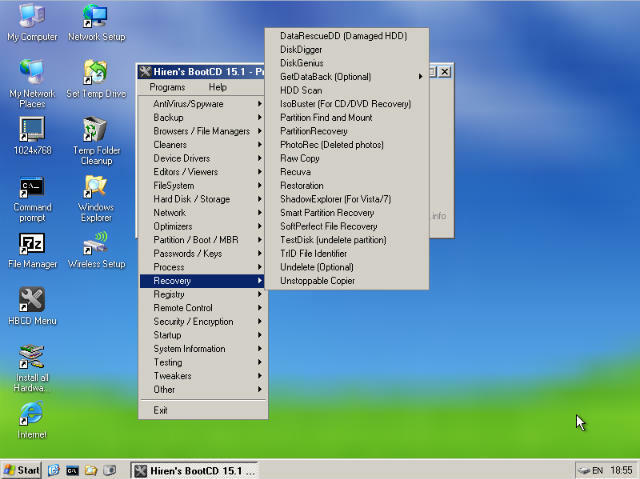 Hiren BootCD - download ISO in one click. Virus free. Download the latest version of Hiren's BootCD with just one click, without registration. It comes with a safe official offline installer for Hiren's BootCD. Hiren's BootCD is a bootable software kit in the form of an ISO disk image, which contains several diagnostic programs, among which are partitioning agents, benchmarks for system performance, cloning and imaging tools, programs for data recovery, MBR tools, BIOS instruments, etc. All of them serve to fix various problems with your system or software, in case if such problems appear. Hiren's BootCD is a universal and quite indispensable tool at times, when you need an urgent means of fixing an issue, and searching for specific high-precision software is not an option at the moment. It's a sort of medkit for computers, serving to be there for a general emergency. Hiren's Boot CD is perfect for users without much experience and with limited acces to software resources who need help with troubleshooting, fixing and recovery. The disk image is bootable, so a user does not even need a working operating system in order to launch the kit. This is especially helpful when the problem is so large your OS does not respond anymore. It is, however, requires that the computer is capable of running Windows or Linux. And most of the tools in Hiren's BootCD are available within a working system. Hiren's BootCD is available as a zipped Iso including information files. The ISO can be burned onto a physical disk or copied to a USB drive. Most of the software is free or shareware. Limits: This software is absolutely free.